The year 2014 started with an early high point: the first HPO Diagnosis in China! 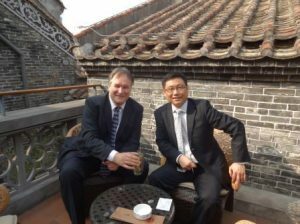 In 2012 we already had the pleasure to conduct a small diagnosis with a large Chinese company, BAO Steel, but that was performed at the premises of the Maastricht School of Management in the Netherlands. This time, we were invited by Shui On Land Limited to conduct the HPO Diagnosis amongst its managers and then present the results during the yearly Management Conference, to be held in Foshan, China. Mainland. Headquartered in Shanghai, Shui On Land has a proven track record in developing large-scale, mixed-use city-core communities and integrated residential development projects which are quite original. This means that the company combines, in an original way, high-quality residential, office, retail, entertainment and cultural properties into a unique environment of “Live-Work-Play”. One of those development properties is in Foshan, a city in the Guangdong province close to Guangzhou with 5.4 million inhabitants. The city gained its name from the three Buddha statues unearthed during in the Tang Dynasty (618-907). It is most famous for the local craftsmen who have great skills in making ceramics. 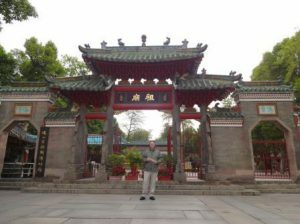 Foshan was one of the four most famous towns in Tang and Song (960-1279) dynasties, having the reputation as the home of Chinese ceramic arts, Cantonese operas and martial arts (kong fu: Bruce Lee was born here). An important landmark in Foshan is the Ancestors’ Temple, which was built in the Northern Song Dynasty (960 – 1127) in honor of the Xuantian God (the God of Water in Taoism). It has been restored to its former glory and still used by the local people who hope to get good blessings and good fortune by worshiping the gods. Several times per day folk shows take place, like the Lion Dance, in which the lion (consisting of two men) dance and jump on high poles. I was shown around the Lignan Tiandi project by Joe Zou, general manager of CXTD Foshan. This project is a prime example of one of the unique development products of Shui On Land: combining culture (the Ancestors’ Temple) with retail (shopping) and entertainment (restaurants and bars) in a clean and safe environment. In addition, apartments are sold which have been build around the project, making sure there is always a lively atmosphere in the area. Needless to say this touring around makes thirsty so we enjoyed a nice cup of Chinese tea together. Then it was time for the main event: the presentation on Shui On Land’s HPO results. The vision of Shui On Land is to be the premier and most innovate property developer in China. As such, the company has started an HPO initiative in which teams of managers look at the current and future business in all its facets. Therefore the HPO Diagnosis was very timely and management expects its results will bring the company to the next level. Approximately eighty managers were present during my talk in which I explained, in 45 minutes, the background of the HPO research, the HPO Framework, the HPO scores of Shui On Land, the attention points for the company, and how to use HPO Coaches during the transition to the HPO status. The time went by very quickly and as I was the last speaker, the next point on the agenda was dinner at one of the nice restaurants in the Lignan Tiandi project. There I had the opportunity to meet with Shui On Land’s founder and chairman, Mr. Vincent H. S. Lo, who I presented my latest book ‘What Makes A High Performance Organization’.